Individuals who have a high level of self-esteem possess a feeling of self-worth and like who they are. Crucial periods for boosting this personality characteristic occur early in one’s life. Children with a positive self-esteem have the ability to successfully cope with both wins and losses not only in sports, but beyond in life situations. Those who develop this critical psychological characteristic enjoy less anxiety, adopt an optimistic perspective on life and experience fewer interpersonal issues, among other benefits. Young athletes who lack this contributing factor to their well-being are more likely to be depressed, engage in risky behaviors or become a victim of bullying. Coaches, martial arts instructors and parents play a major role in enhancing children’s feeling of confidence in themselves. When children succeed in a particular sport, like martial arts, they have an opportunity to build up their self-worth. Instructors and parents can create a conducive environment that fosters children’s skill development. Coaches can enhance young athletes’ self-esteem and improve coach-athlete relationships by being respectful, putting losses in perspective and staying positive. Firstly, listen to the young athletes. Taking the time to sit down and listen can impact a child’s self-esteem significantly. Children feel better when someone care about what they have to say. Sometimes just being silent is enough. Empathy is a powerful force. Try to see the world the way they do. Acknowledging their point of view makes them feel validated and secure, which enhances their self-esteem. 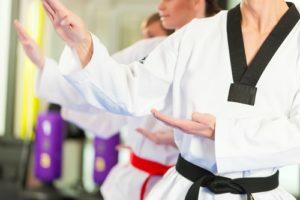 Instead of young athletes replaying mistakes in their heads, they can release negative energy with the support of a coach or martial arts instructor. These role models in their lives can provide children with positive feedback by mentioning what individuals did well in their performance and how they can improve for the next competition. Additionally, people respond better to an uplifting attitude than negative feedback. A bad attitude can make athletes feel poorly of themselves and their performance. When an athlete doesn’t do his or her best, don’t think of them less. How they compete is not equivalent to who they are as people. One way to continue this method is to not just take interest in an athlete’s abilities, but to also express interest in all areas of his or her life.